In yet another consequence of the ongoing War on Drugs, a veteran Ft. Worth, Texas police sergeant was arrested and accused of stealing a pair of Air Jordan basketball shoes during a drug raid after a similar pair was found in his house. 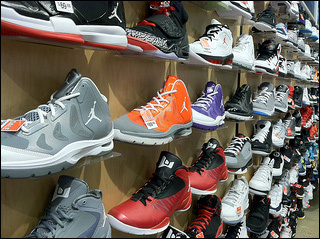 Air Jordans in all sizes. On Oct. 16, Sgt. Antoine Williams, 37, apparently took the shoes during a search for suspected drugs in a house on the 4800 block of Richardson Street in Ft. Worth, Texas, according to court documents as reported by NBCDFW. Two other police officers who were involved in the raid told the Special Investigations Section that the shoes were taken, which prompted a police search of Williams’ home. Investigators seized four pairs of shoes during the search, including a pair of Air Jordans matching those missing from the raid. Green also said that besides the shoes missing from his closet, a new copy of the “Grand Theft Auto” video game and several thousand dollars also disappeared. It should be noted that Williams is a supervisor for the department’s narcotics unit. It also should be noted that this story is yet another tale of government abuse through the failed War on Drugs. Last year, a drug task force in Wis. “confiscated” money from a mother meant to bail her son out of jail. In 2009, multiple motorists filed a lawsuit against the Tenaha, Texas Police Dept. for arresting people and then saying that the charges would be dropped if they “forfeited” money. David Guillory, the plaintiffs’ lawyer, estimated that the city seized $3 million between 2006 and 2008. As the War on Drugs continues its fourth decade and the CIA continues to manage the drug trade for its own benefit, property seizures such as these will continue to persist.